Once upon a time, in the land before children, there was a woman who prided herself on being a good hostess. She’d spend days planning menus, hunting recipes, preparing food, crafting desserts. She’d draw up battle plans more detailed than the D-Day assault, calculating cooking times and sketching table layouts. Then along came the guys and food became about existence, not entertainment. Until Big Guy put his little foot down and stopped all that. “”Mommy, we’re going to eat with the good dishes tonight,”" he told me from atop the kitchen counter. Luckily, he was pulling the stoneware out of cabinet, not the Lenox. I got up to help — more out of a desire to avoid smashed Noritake than out of any inclination to make dinner a production — and he shooed me away. “”No. I’ll do it,”" he replied, somehow managing to retrieve three bowls without breaking a dish or his neck. 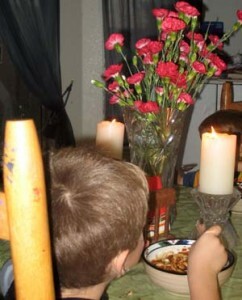 He then set the table and brought the pillar candles in from the dining room. Sometimes he can use his stubborn powers for good, not evil. Table set and dinner served, Little Guy came up with the final touch — he turned out the lights. I think he was going more for brotherly irritation than for ambiance, but it worked. Suddenly, we were just a Chianti bottle short of “”Lady and the Tramp.”" The guys gobbled their food and asked for more. No one called anyone stoopit. Little Guy even used his spoon. And once again, I relearned a valuable lesson from the guys, about taking time to enjoy the finer things even when it’s just an ordinary weeknight meal. About the importance of stopping to smell the carnations. Maybe skabetti for the 5 millionth time isn’t so bad when you dine by candlelight. Maybe next time I’ll let the Lenox come out to play.